In the melting pot city of Ho Chi Minh, you will never get bored due to the variety of activities for you to experience here. There are a long range of things you can try from expansive amusement park to lush gardens or even traditional performances on theatres. A family gathering at weekend after a whole weeks sticking with works and studies is wonderful, especially with a great journey outside together. If you are looking for an entertainment for your family, there are plentiful of activities to tighten family relationship. Here is the list of best family activities for you to have a memorable occasion with your spouse and children. We also include the price, time and location in order for you to choose which one is suitable for your next trip with your beloved ones. Traditional Vietnamese water puppet shows depict the culture, traditions and folklore of Vietnamese life in vivid sets and props, making them one of the best family activities in Ho Chi Minh City. Visitors are entertained by puppets acting on a ‘stage’ of water accompanied by live old-fashioned music played on authentic instruments. One of the most popular places to see a water puppet show in Ho Chi Minh is at The Golden Dragon Water Puppetry Theatre. Show times are daily at 17:00, 18:30 and 19:45, lasting about 50 minutes each. Opening Hours: Daily 17:00, 18:30 & 19:45. Address: 55B Nguyen Thi Minh Khai Street, Ben Thanh Ward, District 1, Ho Chi Minh City. Tel: +84 83 930 2196 Price Range: US$7.50. Artinus 3D Art Museum Saigon features a spacious exhibit filled with vibrant paintings of wildlife, sculptures and popular landmarks that seem lifelike when photographed. The first of its kind in Ho Chi Minh City, its main draw is the Vietnam Zone which features three-dimensional paintings of ladies dressed in traditional ao dai costumes and prominent attractions such as Ha Long Bay and Mekong Delta. 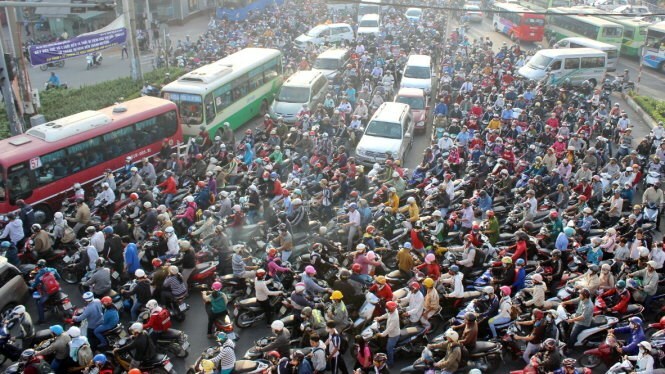 Tickets are priced at VND 200,000 on weekdays and VND 220,000 on weekends. Open daily, Artinus 3D Art Museum Saigon is a 15-minute drive from The Crescent Mall in District 7. Address: 02–04 Road 9, Him Lam Residence, Tan Hung Thuan Ward, Ho Chi Minh City. Tel: +84 93 863 5455. Price Range: VND 200,000 on weekdays, VND 220,000 on weekends. The Ho Chi Minh City Zoo and Botanical Gardens (aka Saigon Zoo and Botanical Gardens) were opened in 1865 by French botanist J.B. Louis Pierre. Housing about 550 animals in the zoo and more than 1,830 trees and 260 plant species in the botanical gardens, it’s listed as one of the oldest zoos in the world. There are a number of different sections to explore including the animal conservation area, orchid garden and plant conservation centre, a children’s amusement area, and a monument dedicated to Vietnamese killed in World War I. Address: 2B Nguyen Binh Khiem Street, District 1, Ho Chi Minh City. Tel: +84 83 829 1425. Price Range: VND 30,000 for Children, VND 50,000 for Adults. Vietnam Adventure Tour lets you enjoy a cyclo sightseeing tour of Cholon, Ho Chi Minh City’s massive and atmospheric Chinatown district. Great for a leisurely ride with the little ones, this four-hour long excursion is guided by an English-speaking local, stopping at the 19th-century Thien Hau Pagoda and Binh Tay Market, where you get to shop for handicrafts and Vietnamese street food. Before heading back to your hotel, the cyclo sightseeing tour ends with a filling lunch at a local restaurant in Cholon. Address: 123 Ly Tu Trong, Ben Thanh, District 1, Ho Chi Minh City. Tel: +84 83 822 9068. Price Range: US$42.50 for Adults, US$31.88 for Children (4–11 years). Superbowl Vietnam at Diamond Plaza Mall Saigon is modern and colourful with all the flashing lights and loud clatter of pins common in bowling alleys across the world. The 32 lanes at Diamond Superbowl ensure there is almost always an alley available, but it might be worth booking on weekend evenings. Prices per hour of bowling range significantly from weekday mornings (200,000 VND) to weekends after 19:00 (375,000 VND). The other main reason for choosing to visit Diamond Plaza is the family entertainment options such as the video arcade on the fourth floor and the Diamond Cinema on the 13th floor. Opening Hours: Daily 09:30–22:30 (Superbowl and Cinema open until 01:00). Address: 34 Le Duan Street, District 1, Ho Chi Minh City. Tel: +84 83 825 7750. This is the place you find lots of videos about travel in Vietnam, landmarks, etc.